A Set of Four Georgian Bristol Green Wine Glasses A fine set of Georgian period (circa 1800) wine glasses in Bristol green. They are made from lead glass and each has a bucket bowl, a stem with rounded knop above a plain foot and a snapped pontil. The glasses are a lovely blue- green colour and have a nice ring when tapped. Dimensions The glasses have a diameter of 2 ¼ inches (7cm) and a height of 4 ½ inches (11.5cm). Condition The glasses are in a lovely condition. There is the odd air bubble from production. For further details and conditions see pictures below... 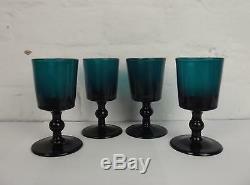 The item "A Set of Four Georgian Bristol Green Wine Glasses" is in sale since Sunday, October 18, 2015. This item is in the category "Pottery, Porcelain & Glass\Glass\Date-Lined Glass\Pre-1840". The seller is "theantiquesstorehouse" and is located in Portsmouth, Hampshire.